To celebrate the 100 Hours of Astronomy, ESO is sharing two stunning images of unusual galaxies, both belonging to the Sculptor group of galaxies. 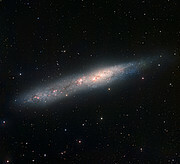 The images, obtained at two of ESO’s observatories at La Silla and Paranal in Chile, illustrate the beauty of astronomy. As part of the International Year of Astronomy 2009 Cornerstone project, 100 Hours of Astronomy, the ambitious “Around the World in 80 Telescopes” event is a unique live webcast over 24 hours, following night and day around the globe to some of the most advanced observatories on and off the planet. To provide a long-lasting memory of this amazing world tour, observatories worldwide are revealing wonderful, and previously unseen, astronomical images. For its part, ESO is releasing outstanding pictures of two galaxies, observed with telescopes at the La Silla and Paranal observatories. The first of these depicts the irregular galaxy NGC 55, a member of the prominent Sculptor group of galaxies in the southern constellation of Sculptor. The galaxy is about 70 000 light-years across, that is, a little bit smaller than our own Milky Way. NGC 55 actually resembles more our galactic neighbour, the Large Magellanic Cloud (LMC), although the LMC is seen face-on, whilst NGC 55 is edge-on. By studying about 20 planetary nebulae in this image, a team of astronomers found that NGC 55 is located about 7.5 million light-years away. 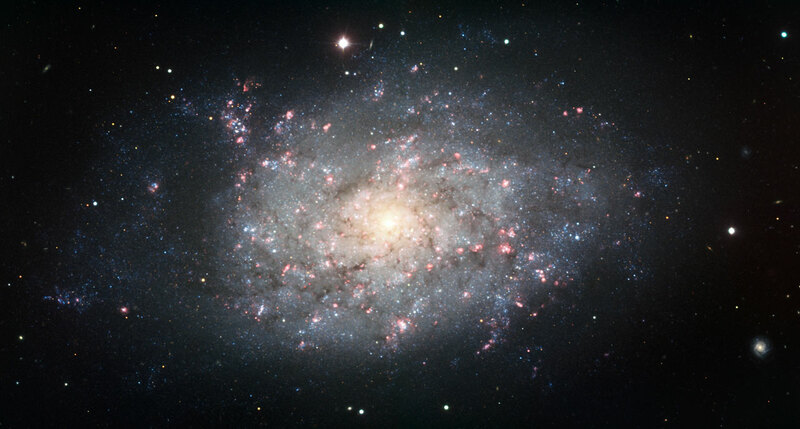 They also found that the galaxy might be forming a bound pair with the gorgeous spiral galaxy NGC 300 . Planetary nebulae are the final blooming of Sun-like stars before their retirement as white dwarfs. This striking image of NGC 55, obtained with the Wide Field Imager on the 2.2-metre MPG/ESO telescope at La Silla, is dusted with a flurry of reddish nebulae, created by young, hot massive stars. Some of the more extended ones are not unlike those seen in the LMC, such as the Tarantula Nebula. The quality of the image is clearly demonstrated by the remarkable number of background galaxies seen, as well as the huge numbers of individual stars that can be counted within NGC 55. The second image shows another galaxy belonging to the Sculptor group. This is NGC 7793, which has a chaotic spiral structure, unlike the class of grand-design spiral galaxies to which our Milky Way belongs. The image shows how difficult it is to identify any particular spiral arm in these chaotic structures, although it is possible to guess at a general rotating pattern. NGC 7793 is located slightly further away than NGC 55, about 12.5 million light-years from us, and is about half the size of NGC 55. NGC 7793 was observed with one of the workhorses of the ESO Paranal Observatory, the FORS instrument, attached to the Very Large Telescope. ESO, the European Southern Observatory, is the foremost intergovernmental astronomy organisation in Europe. It is supported by 14 countries: Austria, Belgium, the Czech Republic, Denmark, France, Finland, Germany, Italy, the Netherlands, Portugal, Spain, Sweden, Switzerland and the United Kingdom. ESO carries out an ambitious programme focused on the design, construction and operation of powerful ground-based observing facilities enabling astronomers to make important scientific discoveries. ESO plays also a leading role in promoting and organising cooperation in astronomical research. ESO operates three unique world-class observing sites in the Atacama Desert region of Chile: La Silla, Paranal and Chajnantor.